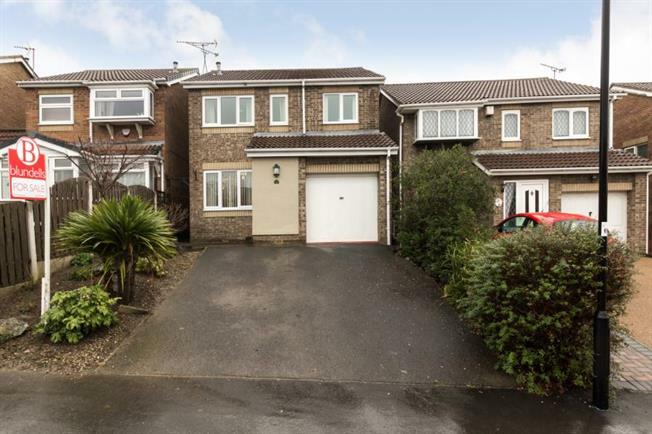 4 Bedroom Detached House For Sale in Sheffield for Guide Price £220,000. Offered for sale is this beautifully presented four bedroom detached family home, situated in Sought after Sothall the property is ideally located for all local amenities and schools. We strongly recommend an early inspection to not be disappointed. In brief the accommodation comprises; to the ground floor the porch leads to the Living room with feature fireplace also to the integral garage, from the living room is the inner hall leading to the Cloakroom/W.C and superb open plan Dining/Kitchen fitted with a contemporary range of solid oak wall and base units. To the first floor are four bedrooms and the modern family bathroom. To the front of the property is a driveway leading to the integral Garage, to the rear is a fully enclosed low maintenance landscaped garden with patio area. Sothall is extremely popular with buyers of all ages, sought after for its superb local amenities in nearby Beighton Village, local schools and close proximity to Rother Valley Country Park. The area boasts excellent local transport links both by bus and Sheffield Supertram, and is ideally situated for links to both the M1 motorway networks and Sheffield City Centre. There are excellent nearby walks on the Pennine trail and the area offers a superb community feel with activities based at the 'Lifestyle' centre and Beighton miner's welfare centre home of the local Beighton Magpies football club. Ideally placed for Crystal Peaks Shopping Centre, Drakehouse Retail Park and a short drive to nearby surrounding local Derbyshire countryside the area has plenty to attract all buyers.